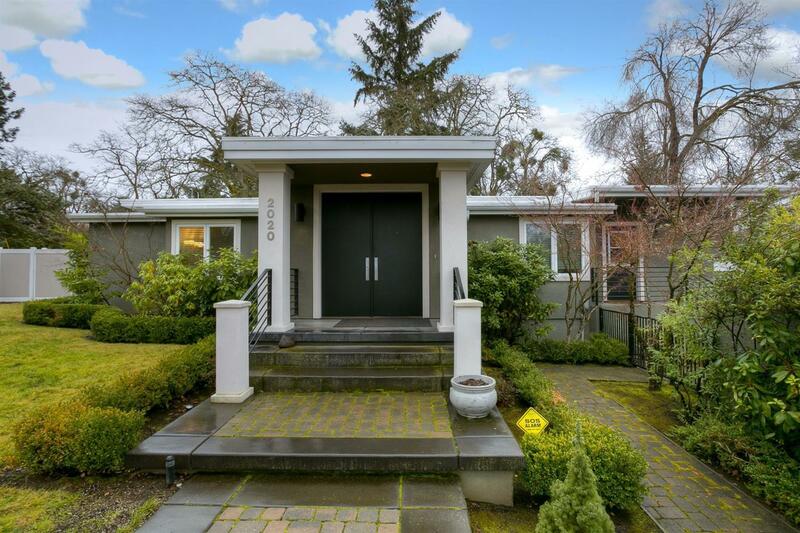 Stunning remodeled mid-century modern home in a quiet, & private area of Old East Medford. Amazing master suite features french doors to the back patio, a large walk in closet w/ quality built ins, & plenty of windows. Elegant, spa like master bath features heated travertine flooring, leathered granite countertops w/ his & her sinks, oversized walk-in shower w/multiple shower heads, water closet, & large soaking tub. Beautiful kitchen features stainless appliances, Wolf 6-burner gas cooktop, dual ovens, Jenn-Air d/w, refrig, island, pantry area w/ pull out shelving & granite counters. This home has so many stunning features: maple hardwood floors, floor to ceiling windows along the entire back wall providing stunning daylight. Four sets of French doors to a large stone patio, perfect for entertaining. Gas fireplace, library type built-in shelving for a peaceful study area, open entryway & foyer, and windows everywhere! This truly one-of-a-kind home sold in hours when last sold! © 2019 SOMLS. All rights reserved. Information deemed to be reliable but not guaranteed. The data relating to real estate for sale on this website comes in part from the Broker Reciprocity Program. Real estate listings held by brokerage firms other than are marked with the BR logo and detailed information about them includes the name of the listing brokers. Listing information displayed is deemed reliable but is not guaranteed accurate by SOMLS. The information published and disseminated by SOMLS is communicated verbatim, without change by SOMLS, as submitted to SOMLS by the Participant. SOMLS does not verify the information provided and disclaims any responsibility or liability arising from any inaccuracy or inadequacy of said information or for typographical errors by SOMLS, or for any delay caused in dissemination of such information. IDX information is being provided exclusively for consumers' personal, non-commercial use and may not be used for any purpose other than to identify prospective properties consumers may be interested in purchasing. Information last updated on 2019-04-26.